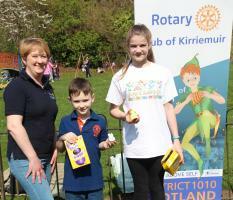 Rotary Club of Kirriemuir - welcome! Please scroll/swipe down through this page to find out more about us, in addition to the pages linked in the menu, top-left. Held in the Old Parish Church on Saturday 04 May 2019 from 10am - 12 noon. Enjoy a cup of Coffee and , if you wish, have your Blood Pressure checked by one of the Local Nurses. 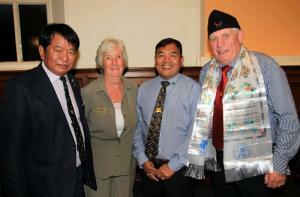 The Rotary Club of the Himalaya Gurkhas is our partner in this project. Proper Toilet Facilities will be provided for Staff and Pupils at 7 schools in Nepal. Work is due to start in Spring / Summer 2019. Thank you to all who helped us raise the funds. in Northmuir Hall on Saturday 25 May 2019 - Contact Bob Harley 01575 575515 or Dave Hoskins 07769 555951 to get your tickets. Team of 4 - £20 which includes stovies. Thank you to all who supported another very successful event in the Den - 1st Prize Ramsay Mudie 2nd Prize. Frances Martin 3rd Prize. Mrs D Reid Picture shows Children's Decorated Egg Winners . Kirriemuir lies 16 miles north of Dundee at the foot of the Grampian Mountains. It is easily accessed from the Dundee/Aberdeen A90 dual carriageway and the A926 Forfar/Kirriemuir road. The "wee red toon", as it is affectionately known, (population approximately 6000) has a long and colourful history. The first record of its name appeared in 1201 but evidence shows that people lived in the area as far back as 700BC. A visit to Kirriemuir is well worth the effort. 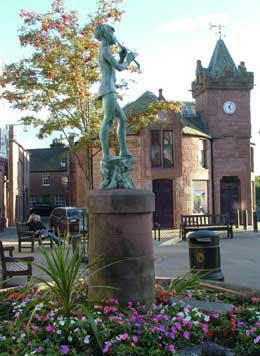 Visitors can visit the birthplace of Peter Pan's author, JM Barrie, admire the town clock, parish church and old red sandstone buildings and browse in the Gateway to the Glens Museum. A half-hour drive takes one to the picturesque Angus Glens or to the stunning coastal area with long sandy beaches and red sandstone cliffs. Glamis Castle, the childhood home of the late Queen Elizabeth, the Queen Mother, is just five miles from Kirriemuir. Golfers too are well served with the town's local 18 hole course as well as the famous championship courses of Carnoustie, Gleneagles and the Old Course at St Andrews within an hour's drive. There are many other good, but less well known, courses close by. There is a good local pathway network and plenty good walking routes of varying difficulty in wider vicinity. At Roundyhill a mile and a half south of the town there is an excellent caravan site with fine restaurant and bar facilities. 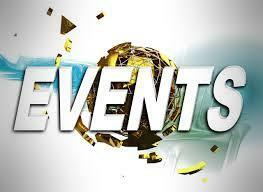 Accommodation is available at the two hotels in the town or in several B&B establishments locally. We look forward to welcoming visiting Rotarians and partners to any of our weekly meetings at the venue and time detailed in the panel on the right. Club membership currently stands at 37 and consists of accountants, farmers, solicitors, land agents, ministers and local business people.